American cuisine complemented by wine on the banks of Carroll Creek. 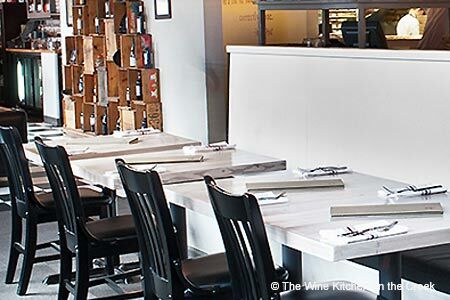 : The Wine Kitchen brings casual wining and dining to the banks of Carroll Creek with alfresco seating. The seasonal menu captures the flavors of local ingredients. Luncheon starters include fried green tomatoes and mini tuna tartare tacos, which may lead to sandwiches like a Mexican-style BLT sparked with guacamole and sriracha sauce and a chicken curry dog on a homemade bun. Sturdier eats come in the form of different steak cuts accompanied by mashed potatoes. Dinner dishes delete the sandwiches and add seafood and vegetarian entrées as well as all-meat plates of roast chicken, rack of lamb and duck breast --- plus those steak presentations. And consider the chicharrones and guacamole to begin the meal. Pair your food with a wine flight. Sweets are farm-fresh and you most likely won’t find the composed blackberry dessert in January, but might encounter the coffee cheesecake. Also located in Leesburg and Purcellville, Virginia.